Peter Forshaw did a tremendous job in organising and hosting the event. As a thesis workshop, the main purpose was to contribute something back to student members of the ESSWE, particularly those on MA and PhD levels. (This, I can say to members of the society who may read this, or those who are considering to join, is part of a general strategy the ESSWE is currently working to implement, in which the organisation seeks to offer more to its members). Although the focus was on alchemy, with a number of excellent alchemy specialists present, students and young researchers got to talk with more experienced scholars in the field about more general research related questions, matters of methodology, how to write a thesis, where to apply for funding, tips about archival research, getting published, etc. Also, since most of the board members of the organisation were present, there was ample opportunity to discuss non-alchemical esoteric topics with appropriate specialists. The day was divided into three parts. 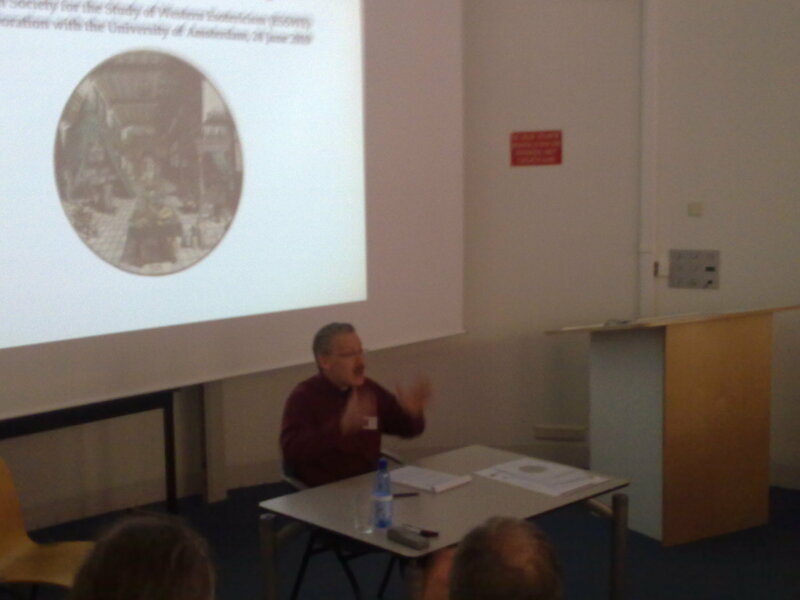 An “Oratory”, with presentations on alchemy by the three guest speakers: Lawrence Principe (John Hopkins University), Stephen Clucas (Birckbeck, University of London), and Jennifer Rampling (University of Cambridge). 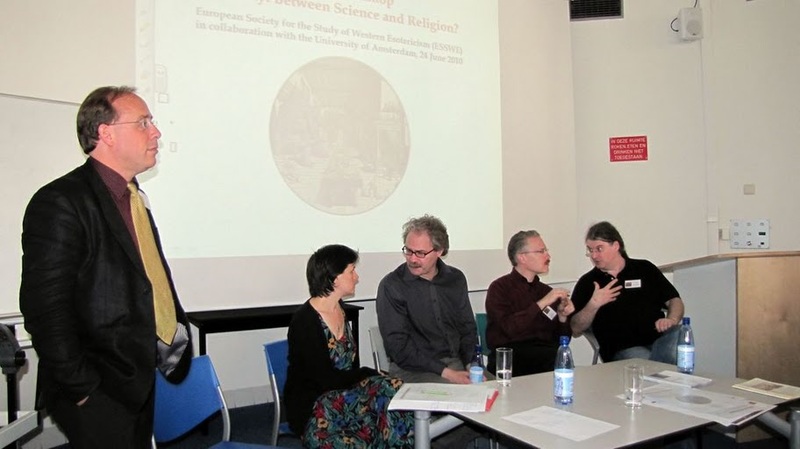 In the second part – the “Laboratory” (the oratory/laboratory outline was clearly inspired by the famous illustration in Heinrich Khunrath’s Amphitheatrum sapientiae aeternae) – all the senior scholars present divided into four specialty groups, where students could discuss other topics. 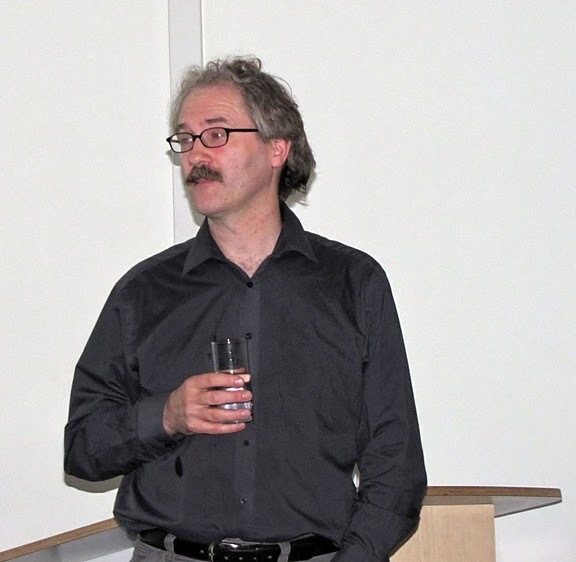 Boaz Huss, Andreas Kilcher, and Jean-Pierre Brach answered questions about kabbalah; Clucas and Principe were available for further questions on alchemy; a group on images was constituted by Peter Forshaw, György E. Szőnyi, and Jennifer Rampling; while a group with Wouter Hanegraaff, Marco Pasi and Mark Sedgwick discussed esotericism and modernity. At the end of the day a round-table was held, where the audience got to ask questions to all the participants, especially discussing general research- and thesis related matters. Some readers of this blog may be interested in the actual content of the initial talks, and I’ll write a little bit about them. I will particularly focus on Larry Principe’s talk, since this gives me opportunity to follow up on a previous post about his lecture in Utrecht a few weeks ago. Also, for those whose interests are particularly in the history of science, the talk touched on some issues which were discussed over at Ether Wave earlier this spring, e.g. about the concept “natural philosophy” (here, here, here, and here), and the demarcations and interpretations of alchemy (here and here). The name given to the workshop was formulated as a question: “Alchemy: between science and religion?”. Principe opened his talk by stating that there are three answers to the question: Yes, No, and Maybe. All of them may be defended, depending on 1) how you use the three key terms (alchemy, science, religion), 2) which period you are talking about, and 3) which person you are talking about. In other words, we need to problematize and deconstruct all these terms in order to have an actually meaningful question, without too much danger of equivocation. But the difficulties with the three key words notwithstanding, Principe held that the most problematic word in the question was the word “and”. When applied to alchemy, “between science and religion” carries with it deeply problematic underlying assumptions. It seems to be the very same “and” as is found in the distinction “alchemy and chemistry” – a distinction Principe, with his colleague Bill Newman, has been fighting to replace for a long time. So what’s the problem with that distinction? First of all, the distinction was not a part of the actors’ categories, if we go back to the early modern period. Secondly, the connotations the distinction has been used with are deeply problematic. “Alchemy” has often been used to refer to “mystical” stuff on the side of “real” chemistry. Also, when used together with “chemistry” it has been put in a proto-science role, where chemistry follows as a progressive later development. Sometimes this has even been used to explain away the alchemical interest of “real scientists”, as just one step on a curve of development. Principe gave the example of one of Newton’s notebooks. First, there are early references to Irenaeus Philalethes, the alchemist. Then, Newton started commenting on the work of George Starkey, one of the “founding fathers of American science”. Then, finally, he devoted his time to Robert Boyle, the real chemist. This is an excellent illustration of how distorted views are produced by this distinction. In actuality, Philalethes was Starkey’s pen-name – they were one and the same person. Furthermore, Starkey was at times a frequent correspondent of Boyle. In fact, the passage from Boyle which Newton uses in his notebook was precisely about an “alchemical” experiment which Boyle had from Starkey/Philalethes. No “progress” based on a switch from one category to another – but continuity. Principe and Newman have proposed a way out of this problem, too: adopting the word “chymistry” to account for a set of different schools in (al)chemical thinking and experimentation in the early modern period. Secondly, never to forget that chymistry is embedded in a broader framework of “natural philosophy”. This is the way out of the troubling “science and religion” straight-jacket. Early modern natural philosophy speculated not only about what nature is constituted of, which forces drive it, etc, but also over such questions as the relation between nature and the divine, the agency of “supernatural” entities, and how nature is placed in broader (religious) narratives about the fall and redemption, eschatology and millennialism. For example, Pierre Gassendi speculated not only on a corpuscular and mechanistic theory of matter, but also questions about the continuity of nature, the immortality of the soul, and God’s interventions. Even Newton’s Principia included speculations on the attributes of God and followed a broader framework of localizing the activity of God in nature. Since this was a thesis workshop, Principe also shared some enlightening anecdotes on the practicalities of doing research. One of his advices was connected firmly with the problem of differentiations and classifications: when doing archival research – never trust the archivists. Archivists may use various labels in liberal and idiosyncratic ways, and you never know where something interesting has been put. Indeed, this is often a reason why interesting items get lost. Such as when Principe looked into a file catalogued as “Travel guide to France and Italy”, and found a chymical notebook by the young Robert Boyle. Last time I wrote about Principe I noted that a possible danger with the “rehabilitation of alchemy” project is to present a too simplistic picture, which sees its relevance only in the experimental practices and theories of nature. As expected, Principe was pushed a little bit on this point during the workshop, notably by the second speaker, Stephen Clucas. After praising the importance of one of Principe and Newman’s articles on the concept of chymistry and the false distinction between alchemy and chemistry (the very readable “Some Problems with the Historiography of Alchemy”, in Newman & Grafton eds., Secrets of Nature, Cambridge UP, 2001), Clucas raised concern about some particular formulations. In several instances, there is talk of chymical processes being “expressed” in religious metaphors, symbolism and analogies. What is implied by this word, expressed? asks Clucas. Does it assume that, whereas there is a religious language which chymical knowledge is sometimes/often encoded in, the religious themes do not take part of the “deep structure” of that knowledge? Is it only a more or less arbitrary rhetoric, a sign of its days and times which just has to be excused? I’ll get back to Larry Principe’s response shortly, but first I will mention Clucas’ follow-up. The “analogies” that are drawn up between physical theories and religious themes must sometimes be seen as very serious ones. For example, when the French poet-alchemist Clovis Hesteau (16th/17th century) formulated his vitalistic theory of matter, where all things are alive and active rather than dead and inert, interprenetrated by a spirit of nature, and furthermore sees the processes of nature as the spirit’s struggle to regeneration. Since the fall of man, nature has fallen too, and is in need of regeneration and redemption. When Hesteau then talks about alchemical practice as helping nature regenerate itself, playing a part in God’s scheme for the delivery of the world, it is hard to see it as “merely a linguistic surface”. Having already mentioned Principe’s views on natural philosophy and chymistry, it is perhaps not too surprising that his response to Clucas’ point was sympathetic rather than confrontational. There has been a bifurcation in the way that his (and Bill Newman’s) research has been received, Principe said, with one side saying there’s not enough emphasis on religion, and another saying there’s not enough emphasis on science. The point has however been, all along, to argue a more nuanced point. In view of this, he would agree that the term “religious expression” may have been used with too little care. The point is really that the distinction between science and religion when it comes to aspects of alchemical practice is not very helpful in the context of early modern natural philosophy. And that this does not only apply to alchemy: it goes equally much for things like astronomy, astrology, mathematics and physics in the period. The green lion (vitriol) consuming the sun (gold). The final talk by Jenny Rampling gave us many examples of impressive imagery and symbolic “expressions”, as she took us through some of the history of the spectacular Ripley scroll. Following up one of the problematizations brought up in the first talk – that of the instability of what alchemists actually have thought – Rampling provided one very clear and particular example. 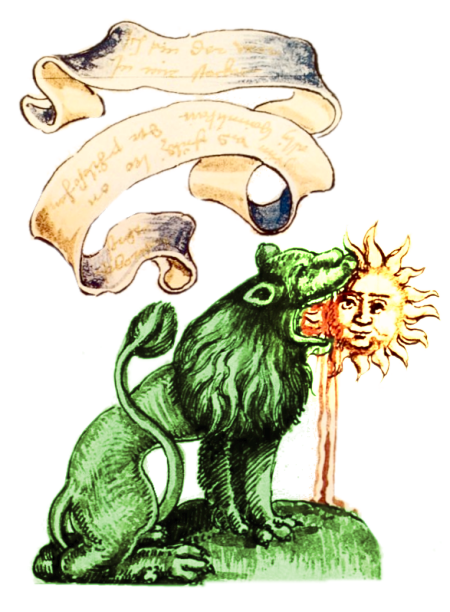 While the symbol of the green lion had been used to refer to green vitriol, and the red lion to red lead, the Ripley scroll changed these attributions. It spoke of vitriol as “the green lion of fools”, and contended that the real green lion was in fact extracted from red lead. The red lion, on the other side, was referred to antimony, an element which was for a time very popular as a medical remedy. This, again, speaks to the point of being aware of the various schools of chymistry, their contexts and goals, as well as methods and preferred ways of using the symbolic expressions. All in all the workshop seemed a success. The turnout was good, with students from all university levels represented, from countries like the Netherlands, England, Romania, Spain, Canada, and Norway. It’s a good opportunity to make contacts, discuss thesis related problems with like-minded, and have a good time. The morning after, there was also time to visit the Bibliotheca Philosophica Hermetica, have a look at some original alchemical manuscripts and printed works, and generally familiarize oneself with the esotericism research community that exists in Amsterdam. The ESSWE itself is very happy with this first thesis workshop, and looks forward to developing it into a biannual tradition.